First of all, something tangential taken, in a schoolgirl fashion, from a classic book, from The Glass Bell by Sylvia Plath, dedicated to Monsieur Dumont, who seems preoccupied with insanity: "[...] when I was sliding under the shadow of the poplar trees, cool like the bottom of the sea." Camille Claudel 1915: a portrait of Camille Claudel - sculptor and graphic artist, the former mistress of Auguste Rodin and sister of the writer Paul Claudel - captured by Dumont around the age of 40, when she is confined in an insane asylum within the walls of a Catholic monastery. Three days in France, 1915, in the midst of war. Camille is paranoid and suffers from a persecution complex. It seems that what brought her to this state was a deep disappointment caused by her relationship with Rodin, a relationship that at the time brought her family's disapproval, to which would be added one or two abortions. In a fit of schitzophrenia, she became convinced that Rodin was usurping her creative spirit and that he'd send accomplices in her small art studio on the shores of the river Seine to steal her ideas, sketches and sculptures. The real Camille Claudel actually destroyed with her own hands most of her artwork because of this suspicion. The problem is that twenty years later, she still continues to feel threatened by similar things, including the possibility that some of the sculptor's acolytes are trying to poison her. In an interview, Dumont declares that it sometimes happens, when you meet someone, that you can see in that person's gaze the remnants of the past that they carry with them. That's the angle that interested him about Camille's character: that of a woman that "was", respectively the state and the inertia ("nothingness," as Dumont states) in which we find the present that we observe on the screen. This succeeds only partially. In part the film is and is not a film à la Dumont; in part it misses some things, in the sense that it tries to express the foundations of lucidity in a context of madness. Even though the film creates, at the very least, feelings of indignation in spectators with respect to the fact that it enters into contact with a character who abandons life, it also conveys the message that we should regard Camille as someone who has reached a state of grace through acceptance. Or, probably what troubles me most, is the fact that he doesn't give enough time or attention to this transition from frustrated anger, repressed aggression, inertia and the refusal of live, on the one hand, to the revelation of a form of the sublime or of grace on the other. Bruno Dumont, where is the sequence where I, a poor spectator munching pop corn, can understand that this woman finds meaning by giving up on her sense of self? What does it mean, in the end, when she gazes up and her face is illuminated by a cold white sun, after which you rush to put a banner (like you did at the beginning of the film, where it was okay to do so), in which you list a few sinister chronological dates? No, Burno Dumont, you know as well as I do that's not it. And yes, I regret terribly that you've become so affected. To hell with the-gaze-towards-the-sky! Pardon my vulgarity, but telle-quelle doesn't express any moment of revelation. Maybe you will reply that there's a still shot I didn't observe from 53'58" to 54'50" where Camille holds a rosary in her hand, looking down, after which she directs her gaze out the window and observes a nun planting a tree. So what? I hope you don't want to insinuate that the acceptance of her fate comes from the projected reading of this gesture? Please don't insult me. My secondary objections stem from the fact that the film becomes at times too schematic and chooses to include in a rather obvious manner some narrative explanations about Camille's backstory - even though, yes, cher Bruno, the allusion to the little scene from Don Juan was kind of cool (the second and last thing I appreciate about the film). But it would have been nice to not introduce it so heavy-handedly, don't you think? "Mademoiselle Claudel, take a bath. Mademoiselle Claudel you're too dirty." 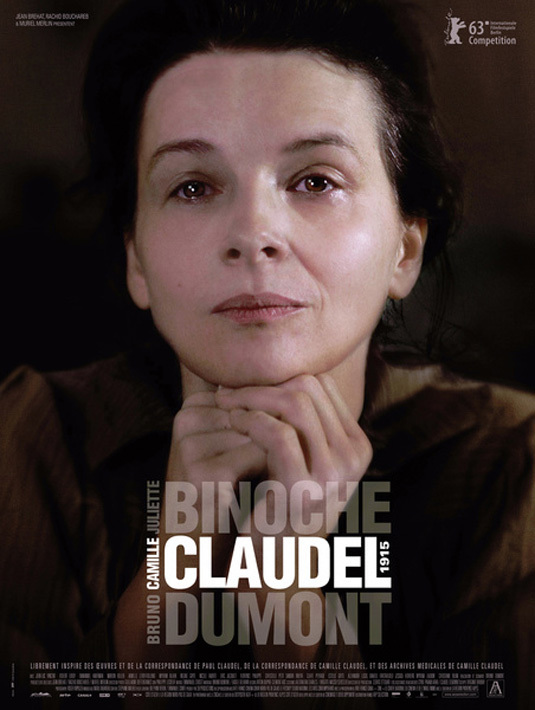 Mademoiselle Claudel (Juliette Binoche) stands with her back to the camera, caught in a wide screenshot wearing a white shirt, with her hair disheveled. Mademoiselle Claudel is carried by the hands of some nuns with moist eyes towards an aluminum tub covered by a white sheet which holds the water that will clean this aged, livid woman, refractory even about self-preservation; about those banal things that mentally healthy people routinely do without necessarily giving them any importance. During the first part of the film (the best one, in my opinion), we understand in terms of the level of sensory-cinema-type-Dumond that to this state of affairs (a lucid woman surrounded by mentally handicapped people, played by unprofessional actors) is added, latently, the theme that his woman will explode at any moment. In the dining hall, the rest of the patients form a common table of stimuli that cause anxiety. They hit the table with their knives, emit almost inhuman sounds, drool uncontrollably. At this moment, we see the victim. Rather than being rebuffed, she chooses solitude. She walks to the external courtyard to eat the potato she boiled herself (a singular privilege given to her by the heads of the asylum, because of her fear that the food could be poisoned). For a short while, she escapes the aggressors. She sits down on a bench, taking a bite, in an almost primitive fashion, of the potato while gazing blankly ahead. Soon thereafter, she is left with one of these aggressors. This mechanism is repeated several times by Dumont with dramatic variations, such that in this first part we comprehend that she's not allowed to eat, that she's not allowed to cry, that she's not allowed to pray. Sure, Bruno, I was paying attention and noticed that you tried - you sneak - to establish nuances. That, little by little Binoche and us, we see and accept what you like to call "the humanity" of these - as Camille refers to them - "creatures". If that's what helps you fall asleep at night, fine. But, just between you and me, you don't pose any deontological problem by featuring these people. I'm afraid that this film can only be accused of banality. For those of you who haven't seen the film or aren't familiar with Monsieur Dumont or with his highness's practices: When I say that he expresses himself in haptic-sensorial terms, I want to say that he fully valorizes (through his choice of actors, through the way he places and directs the camera) the actors' physiognomy (most of the time amateur actors - it shocked some ladies 15 years ago that his lead actress from L'humanité took the first prize for the best female role at the heaven-on-earth-of-legitimization-of-film, a.k.a. Cannes); that he amplifies the level of surrounding sound; or that in the past he made you feel the moistness of the sweat, the mud under the skin, or the sand on the face. Here, I don't remember empathizing with other sensations other than taking a bite out of a measly potato and, I don't say no, maybe she also drank two or three glasses of water eagerly and mechanically, like when you are seriously dehydrated after a serious hangover. And, I admit, there's another sequence where the film orchestrates, against the background of Camille's lamentations about her life in the asylum, an interplay between belabored breathing and an insufferably long silence on the part of the psychiatrist, an interplay which, certainly, creates tension. I'm irritated because there are some people (see, if you have nothing better to do Maryline Alligier) that don't feel good until they don't praise to the sky the haptic expressions of Dumont's films in a pompous manner, translating for us how this producer trained in philosophy creates, in fact, a discourse about man that becomes fully human in the instant between instinct and grace. I'm also irritated because, with the exception of Twentynine Palms (2003), Dumont encourages such philosophico-poetic interpretations. He encourages them fully. But I digress. The narrative event that is about to happen during those three days, which Camille hopes will lead to her release from the asylum, is a visit from Paul Claudel: a scene in which the only thing that may be worth mentioning is his physical immobility in the moment when his sister (now with her hair nicely pinned behind her and a few flowers peeking among strands of hair) hugs him. The rest, dear Bruno, namely that medalion-portrait of Paul Claudel above the writing desk and his monologue about his discovery of faith and blame of Camille for the abortion, for her "contempt of fellow man" (apparently fame got to his head) etc. from a narrow-dogmatic point of view are monologues that you yourself admit don't make much sense. Only to you they seem a chant, to me a waste of film - filming them, I mean - including giving the role of Paul to a beginning actor, Jean-Luc Vincent. I can only surmise that this is the result of a serious lapse in judgment. What else is there to say? Reductive (in the sense of simplistic-demonstrative) remarks of the genre (Binoche exclaiming in tears): "I'm still a human being!" My modest opinion, Monsieur Dumont (pay attention, Maryline), is that if you insist on making movies about humanity, it wouldn't be a bad idea to go easy on such remarks. I really don't think they're effective and, what's more, they don't suit you. Aside from that, I await with interest your next film. I'd like to be indigestible, to make my hair turn white, with subtle remarks from which I won't understand anything. Enough with the transcendental! P.S. : I liked the rocks and the wind and all those muted, lifeless colors.